I finally had a chance of trying Gordon Ramsay’s Christmas Turkey. It was awesome and stress free (I have tried several lengthy and stresfull recipes on the internet). This is the recipe I will be using, in future. However, I am not sure these temperatures would work for bigger birds say 10kg (22Ib). I think the temperatures would need to be adjusted, and probably, the turkey would need to be loosely tented, to avoid over browning. Herbed butter: mix all ingredients. Season with salt and freshly ground pepper and add a touch of olive oil. The Bird cavity: season the bird cavity liberally with salt and freshly ground pepper. Add the onion, apple, lemon and rosemary sprigs. Close the cavity with a toothpick. This is the best roast turkey I’ve had so far!!! The bird I roasted weighed 6.6kg (14Ib). I first roasted at 430ºF (220ºC) convection for 18 minutes then turned the oven to normal setting at 350ºF (180ºC) for 1 hour, then reduced the temperature to 330ºF (165ºC) at normal setting for another two hours. My total roasting time was 3 hours 18 minutes. I rested the bird for 2 hours, then carved it. It was the best turkey I ever had. Juicy, tasty and stress free to make. I highly recommend this recipe. October 8, 2018: I roasted a 4kg (9Ib) turkey for 2 hours 18 minutes. Perfectly roasted!!! Make the herbed butter: mix all ingredients. Season with salt and freshly ground pepper and add a touch of olive oil. Season the Bird cavity: season the bird cavity liberally with salt and freshly ground pepper. Add the onion, apple, lemon and rosemary sprigs. Close the cavity with a toothpick. To moisten the breast: Lift and loosen the top skin (do not tear). Also loosen skin around neck cavity. Take a ball of the herbed soft butter and carefully lift the skin above the breast and insert the butter and massage it all over the breast. Also lift the skin under the neck cavity and insert and massage butter. Roast the turkey for 18 minutes at 430ºF (220ºC), convection setting. 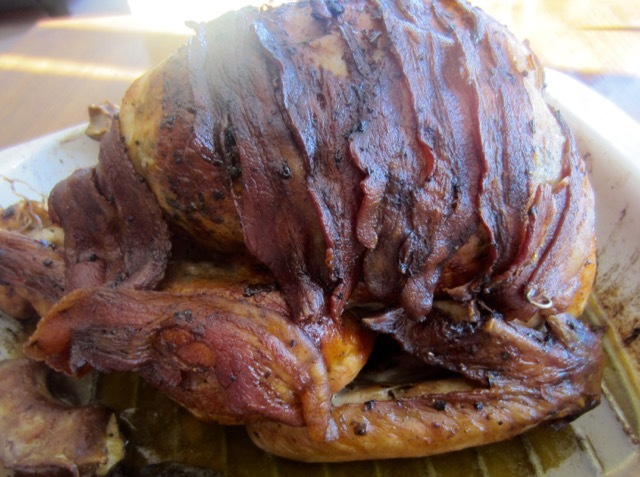 Remove the turkey, baste liberally with the juices and cover the breast up to thighs with smoked streaky bacon (all the bacon in my local store are streaky-I never saw anything else). 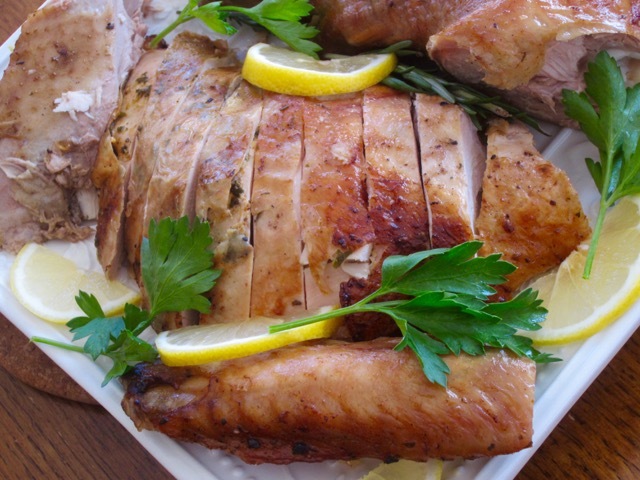 Reduce the temperature to 350ºF (180ºC) regular setting and roast the turkey for 1 hour. 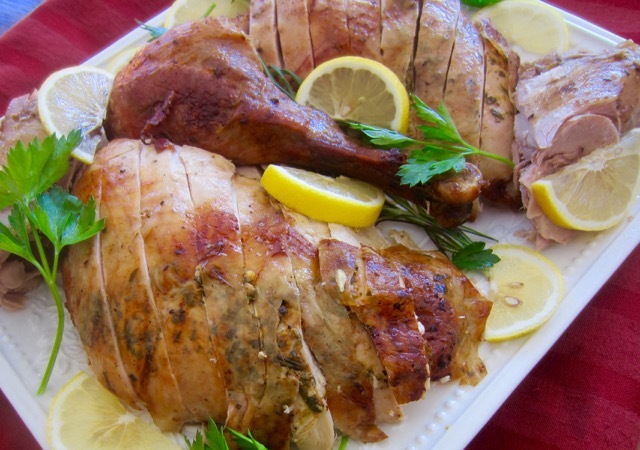 Remove the turkey and baste liberally with the juices. Reduce the temperature to 330ºF (165ºC) regular setting and roast the turkey for another two hours, basting, liberally, every hour. Check temperature for doneness. 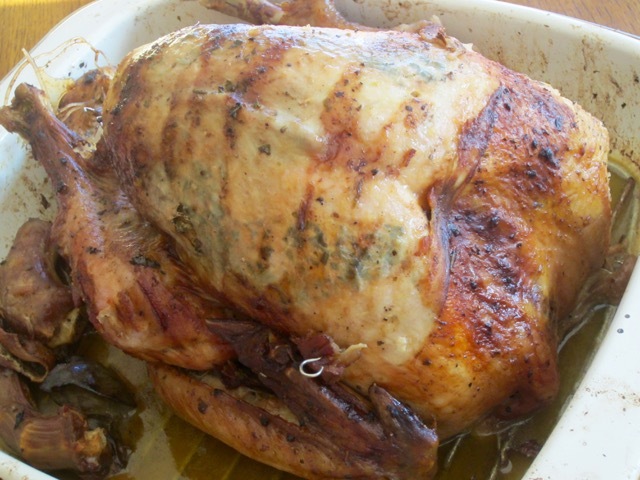 My 14Ib (6.5kg) turkey was done in 3 hours 18 minutes. 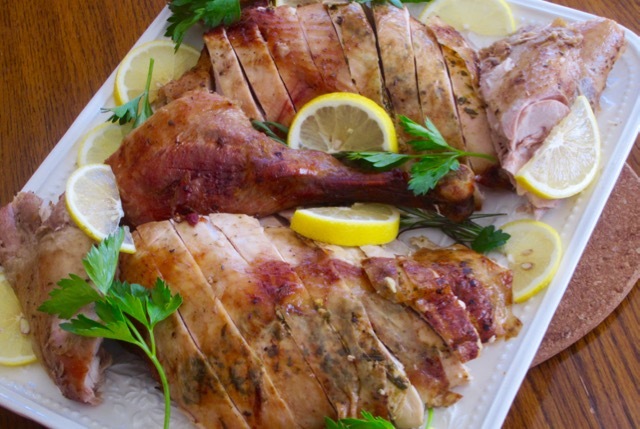 Resting the turkey: Remove turkey from roasting juices and set aside to rest for at least 1 hour. The longer the better, according to Gordon Ramsay. Carve the turkey. 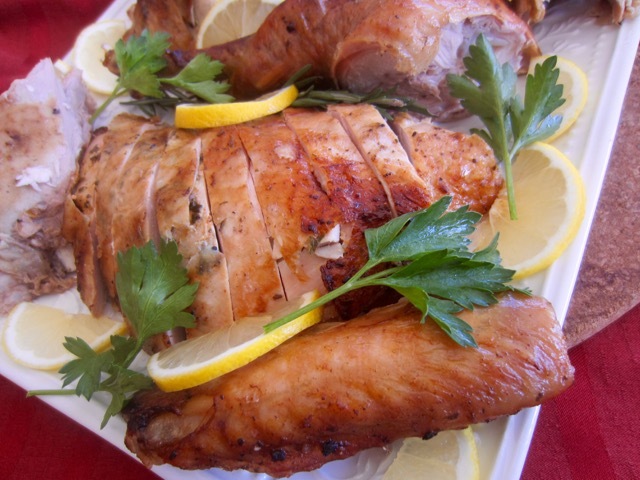 Drain the excess oil from the roasting pan juices and set the roasting juices aside. Cook the bacon, onions and lemon. Add a few rosemary sprigs to give it an aromatic punch, tomatoes (to thicken the gravy and give it a lovely fresh taste), the tips of wings and parsons nose. Add a glug of cider (it adds a lovely supple flavour) and the roasting juices and let cook until reduced in half. Mash the vegetables with a potato masher to extract maximum flavour, then add the chicken stock and let cook again until reduced in half. Taste and adjust seasoning and then sieve the gravy. Use the back of the ladle to push the meat and vegetables through the sieve to extract maximum flavour. Toss in fresh rosemary sprigs to the sieved gravy to infuse rosemary flavour. This is the video I use to carve my turkey. It works perfect every time!!!! Next What is a Punnet? I’m guessing a lot of benefit in the recipe is the resting time. I don’t think most cooks allow enough time for a big bird to rest. I agree.Resting time is very important!